Bellingham Covenant Church is just 110 years young...and we are still eager to love and serve the Bellingham community we call home! Bellingham Covenant Church was founded in 1905 and the first facility was close to downtown on the corner of Forest and Champion. Being primarily immigrant Swedes, the church held services in Swedish until transitioning to English in 1940. This was typical of the entire denomination at the time, as the Evangelical Covenant church grew out of Swedish immigrants coming to America in the late 1800's. In 1965, the church built a facility on Sunset Ave (present location of Lowes Home Improvement) and met there until 2001. Senior pastors during this time included Carl King, Ray Anderson, Carleton Peterson, Ken Larson, Brad Hill and Jerry Johnson (interim). In September of 2003, the church celebrated the opening of its new campus and facility under the leadership of Senior Pastor Dan Boyce. 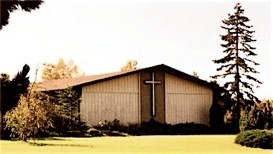 In 2005, Paul Petersen was called as Lead Pastor. Even as we attempt to reach new generations with the message of Jesus, we also celebrate staying true to the original intent of our founders. Our vision continues to flow from the essentials of historic Christian Faith, while living and working in a way that makes it relevant for our community and world today.